Keystone Spill Likely Caused By Construction Damage, Investigators Say : The Two-Way The leak was initially estimated to have released some 210,000 gallons of crude. Federal investigators say that they now have an "unconfirmed lower spill estimate," without specifying how much. The pipeline on rural farmland near the small community of Amherst, S.D., was likely damaged when it was installed in 2008, federal investigators say. 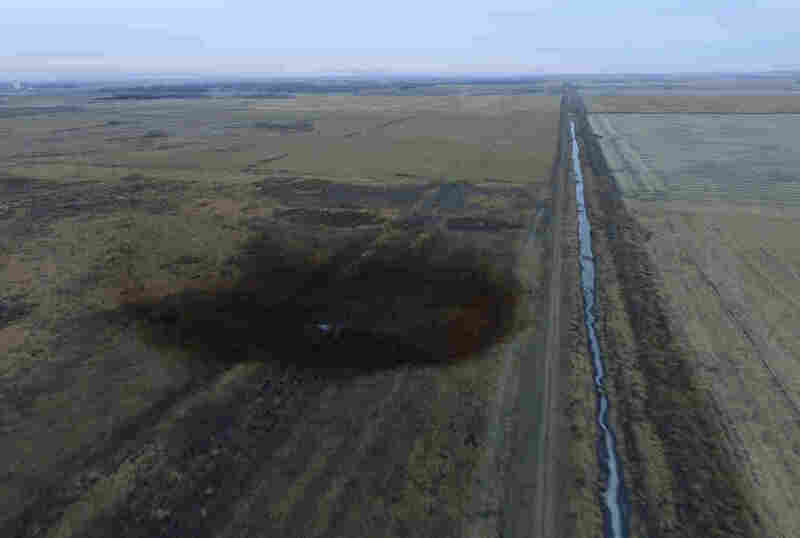 Federal investigators say that construction damage was likely to blame for an oil spill earlier this month from the Keystone pipeline in South Dakota. The Keystone Pipeline is a 2,687-mile crude oil pipeline that runs from Alberta, Canada, to Nebraska, where it then splits, with one portion running to Illinois and the other to Texas. It is owned by TransCanada, the same firm that is seeking to build the controversial Keystone XL pipeline. The spill happened on rural farmland near the small community of Amherst, S.D., and was initially estimated to have released some 210,000 gallons of crude. Federal investigators say that they now have an "unconfirmed lower spill estimate," without specifying how much. According to a report released by the Pipeline and Hazardous Materials Safety Administration, the company detected a pressure drop in the pipeline early in the morning on Nov. 16 and started to shut it down three minutes later. They say the spill was likely caused because of mechanical damage that occurred when this portion of the pipeline was built in 2008. The damage, the investigators add, was probably caused by a weight installed at the time. "Such weights are used in places where changing water levels could make a pipeline float," NPR's Jeff Brady reported. The federal agency says that TransCanada received a special permit in 2007 allowing it to operate at a stress level higher than regulations typically allow. The company got a permit for it to be operated at a stress level of 80 percent of what the steel pipe should be able to handle at a minimum, as opposed to the typical 72 percent. According to the report, the company was also required to inspect or monitor the pipeline more closely than usual. The PHMSA says it is still investigating the incident. TransCanada said earlier this week that it was starting to operate the pipeline again with reduced pressure starting Tuesday. A spokesman told The Associated Press that a "safe, controlled and gradual startup" of the pipeline has begun. It wasn't immediately clear when the pipeline would be back to full capacity. Last week, the company stated that some 170 people were working to clean up the site, and that they had recovered some 44,730 gallons of crude. It added that the crude had not caused any "water issues" to date. "Keystone has leaked substantially more oil, and more often, in the United States than the company indicated to regulators in risk assessments before operations began in 2010, according to documents reviewed by Reuters," the wire service reported. The separate Keystone XL pipeline, subject of major criticism from environmental groups, cleared a major regulatory hurdle earlier this month when it was approved by the Nebraska Public Service Commission. However, NPR's Colin Dwyer reported that "the regulators rejected TransCanada's preferred route through the state, suggesting another one farther east that would avoid the state's Sandhills region." That route change has complicated the process of building the more controversial pipeline, because it involves counties that had not previously been included in the path.